Two weeks ago, a conference was held to mark the twentieth anniversary of the establishment of the Parliamentary Commissioner for the Environment. At the time, the idea of an independent ombudsmen, reporting not to Government but Parliament was novel, but this model has been followed by Ontario, Victoria and others. We would like to publicly thank the outgoing Commissioner, Dr Morgan Williams, for his tireless work and wish Dr Jan Wright all the best in her position as the new Commissioner. The debate at the conference reflected the progress we have made in managing our shared goods. The overall feeling was that despite well-designed policies, institutions and a desire for a clean, green New Zealand, the nation overall has gone backwards on greenhouse gas emissions, soil and water quality, non-point source pollution and biodiversity. The lack of progress towards sustainable management over the last twenty years can be put down to a lack of political will stemming from a lack of public awareness of our unsustainability. This lack is changing fast, mainly as a result of the credible, substantial science about climate change, clearly presented by Al Gore, Sir Nicholas Stern, the IPCC and others. However, the desire for the substantial behavioural changes that real progress would need is not yet widespread. Will we get there in time? To a large extent, we manage what we measure, so it was good to see at the conference a strong push for better reporting on the state of our environment. One speaker claimed that we spend a billion dollars measuring money, in the form of accountants, banks and such. Given how little we spend measuring the environment, is it any wonder the state we’re in? I dunno, rocket-propelled chainsaws and environmental audit organisations in one post? I’m wierd. The house at the bottom of Norway Street? We looked at that flat-hunting once. Well actually the tiny flat under the house. Aren’t the teeth on that chainsaw the wrong way around? Either that, or the flaming thing’s upside down! 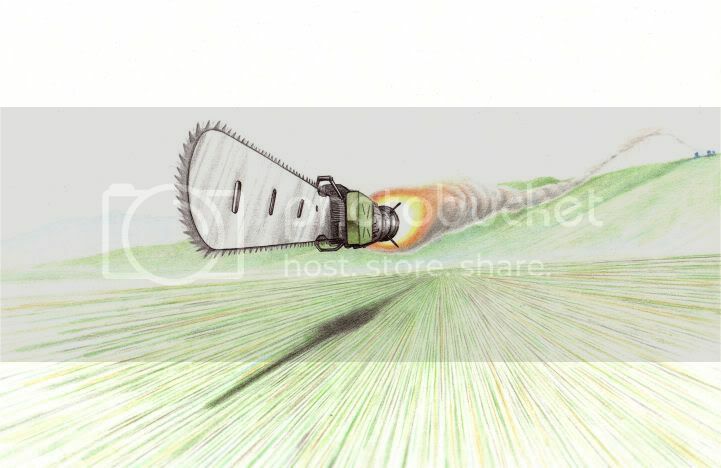 Its a flying chainsaw. I think it can fly whichever way up it likes. HA! I win at cool toys! It is my chainsaw. I loves it. You can’t have it. Pfff. Las0rz are not match for the might of my rocket-powered chainsaw!